The author seems to like the term ‘rites de passage’. Since he quotes Eliade, I am sure he knows that a ‘rite de passage’ is not the same a an initiation into a warrior bond. That said, Hebestreit tells a story in which Celtic warriors go down not so much a Wicker Man, but a wicker-wolfs-head during their initiation. 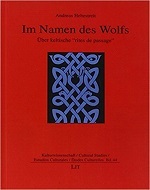 He refers to Roman authors, Teutonic sources, a range of anthropologists and investigates the meaning of the wolf in ancient societies onwards to more recent one (after Christianisation). I like to think that I read German, actually I frequently do, but somehow a text of a century old is easier to me than a recent one. Also in the little book of Hebestreit I have the feeling that I miss a lot of details and nuances and I feel incompetent to go into his theories in detail. Therefor I will refrain to informing you that there is another book about Medieval warrior initiations which may not bring much really new, but there sure are elements that were new to me.